The designer behind the Vertu brand, the top-end luxury brand founded by Nokia, has a smartwatch in the works. As suggested by Frank Nuovo's high-end background, the new watch will focus on "the artisanal aspects of the traditional watch market", coupled with "the benefits of state-of-the-art wireless, multipart functionality" ready for launch in early 2014. 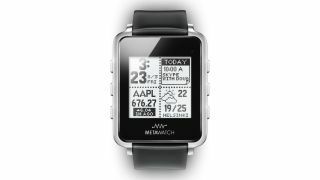 He's joined the ranks at Metawatch which already has a smartwatch on the market (pictured). There isn't much in the way of spec to talk about just yet, but Metawatch is set to make it - the smartwatch company that was created as part of the Fossil watch brand. Metawatch's CEO Bill Geiser claims to have be "gnawing on [Nuovo's] ankle for several years". "To me it's about crafting beautiful products," he added. "That's a word you rarely hear in the smartwatch arena - the word beautiful."